The Eurasian Skylark has a large range, estimated globally at 10,000,000 square kilometers. Native to Asia, Europe, and North America, this bird prefers grassland, wetland, marine and shrubland ecosystems. The global population of this bird is estimated at 79,000,000 to 160,000,000 individuals in Europe alone and does not show signs of decline that would necessitate inclusion on the IUCN Red List. For this reason, the current evaluation status of the Eurasian Skylark is Least Concern. Eurasian Skylark: Common in Hawaii; this species occurs accidentally during the winter along the Pacific coast to northern California. Siberian race occurs rarely during migration along the Aleutian archipelago. Preferred habitats include farmlands, moors, salt marsh, heaths, upland pastures, and industrial waste grounds. Song is a series of rapid trills and whistles given in flight. Flight call is a repeated "chirrup". The Eurasian Skylark is known for the song of the male, which is delivered in hovering flight from heights of 150 to 300 feet, when the singing bird may appear as a dot in the sky from the ground. The male has broader wings than the female. This adaptation may have evolved because of the females' preference for males that sing and hover for longer periods and so demonstrate that they are likely to have good overall fitness. The song Alouette is a song about the plucking of a Eurasian Skylark. Alouette is the French word for Sky Lark. A group of larks has many collective nouns, including an "ascension", "chattering", "exaltation", "happiness", and "springul" of larks. A large taxonomic order that includes, titmice, warblers, silky flycatchers, and finches, the larks are also counted among the one hundred eighteen families of birds in the PASSERIFORMES (pronounced pas-ser-i-FOR-meez). The larks, or Alaudidae (pronounced ah-LAU-dih-dee), are composed of ninety-seven species in twenty-one genera found mostly in Eurasia and Africa. 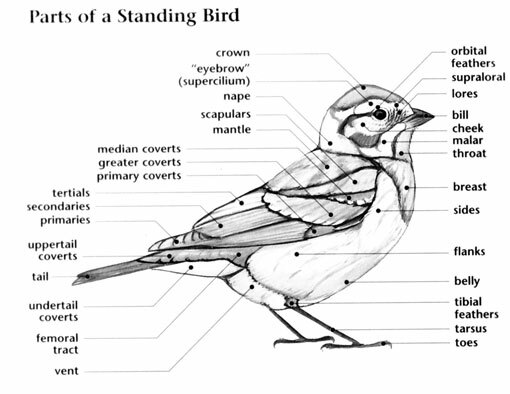 There are two species of larks in two genera found in North America. 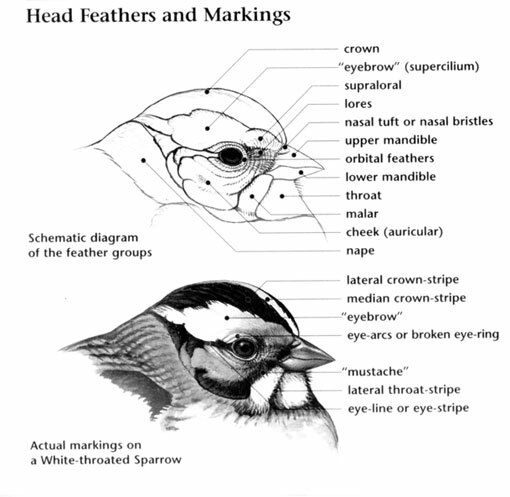 These are the Horned Lark and the Eurasian Skylark. 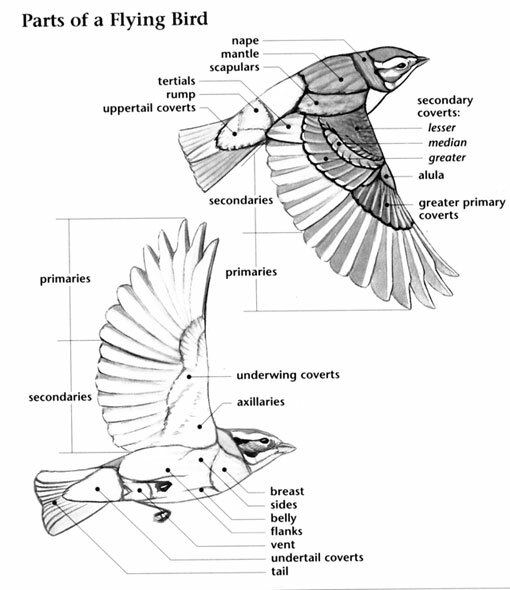 Larks are mostly known for singing in flight. Like many other larks, to make up for the lack of trees in the open habitats it prefers, the Horned Lark flies high up into the sky to sing its tinkling song. Members of the Alaudidae are small, plump birds with rather short, pointed bills, rather short tails, and long wings. They have strong, medium length legs adapted to their terrestrial behavior. Most larks are dull colored birds with streaked, brown, and white plumages that match their grassland habitats. The Horned Lark is one of the more colorful species with varying degrees of yellow on the underparts, a handsome black mask, breast band and feather tufts on the head that resemble horns. The Horned Lark is widely distributed in North America, breeding throughout the United States and Canada except in the southeastern United States and in boreal forests. The Horned Lark is a non-forest species that prefers grasslands, tundra, barren fields, airports, and deserts. The other species of lark in North America, the Eurasian Skylark, is a common introduced species in similar habitats on Hawaii, and occurs as a rare vagrant on the west coast. The Horned Lark undertakes migrations to the lower forty-eight states from breeding grounds in the high arctic and Canada. The Horned Lark is mostly solitary in nature although can be found in loose flocks during migration and in winter. This species forages on bare ground and sparsely vegetated areas by walking along and picking up seeds, grain, and insects from the ground. They are strong fliers and are often heard calling as they fly high overhead. Lark species in North America are not threatened, the Horned Lark actually having one of the largest populations of North American birds. However some lark species are threatened in Europe and Africa, the Sidamo Lark of Ethiopia actually being one of the most critically endangered species on the continent. This African bird species has a very limited distribution and is declining due to loss of its savannah habitat. In Eurasia, the Horned Lark is known as the Shore Lark because it is primarily restricted to beaches and other coastal habitats due to competition from other lark species. Without competition from related species, in North America, it has occupied most types of sparsely vegetated habitats and has evolved into several distinct subspecies. Paired contour feathers on top of the head of the bird.